To paraphrase Forrest Gump, "life is like a hamfest, you never know what you are going to get." It's true. I've been to many hamfests, and even when I have a pocket full of money, I never know what I'm going to walk away with. Sometimes, I barely spend much more than the price of admission, and other times I miss out one some good deals because I just don't have the cash. Perhaps that's what keeps me coming back over and over -- you never know when you are going to find that great deal. The Dalton hamfest wasn't as big as last year -- no doubt the drizzly rain had kept many away. But it wasn't really cold -- just a little damp. Not enough to dampen the spirits of a true hamfest hunter. I've gotten to the point where I take a list to each hamfest. It's too difficult to remember all the bits of equipment and parts I need to keep an eye out for. It fits on one page, so I can fold it up and stuff it into a pocket. I'll take it out a couple of times during a hamfest and go over it, just to keep the items fresh in my mind. Despite the preparation, there's often something that catches my eye. Like this oscilloscope. While prowling the tables, I saw another unit (a model 1420 - 15 MHz) on a table that was partly disassembled. All the pieces appeared to be there, it looked like it just needed to be re-assembled. The owner was busy at the time, so I figured I'd swing back by later and ask about it. Well, someone else got to it first, because I didn't see it again the second or third time I went by that table. Another seller also had a small 'scope -- a model 1422 - 20 MHz. It was intact, if a little dusty, and clearly the carry handle wasn't original. One of the knobs was missing. But, it looked promising, so I asked the seller how much? $25. Hmm. 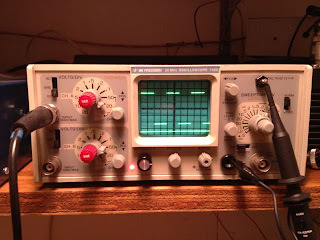 I've purchased a Heathkit solid-state 5 MHz scope for $10 before, but it was a full-size unit. But this was a small portable scope. Given the heft, I bet it even had battery power. I asked if it worked, and he said it did. (Not that that means a lot at a hamfest) So, the sale was made. Now that I had another 'scope, I needed probes. Half-way decent probes can be expensive -- more expensive than this oscilloscope. After a pretty thorough search, I found a new-looking Avex 10:1 probe for $15. One is good enough for now, I should get more at the next hamfest. ('scope probes, after all, are on the list!) I also picked up a miniature knob. Of course, the first rule of bringing any new equipment home is to take it apart. I did plug it in and verify that it appeared to be working -- two nice traces on the screen. Taking the panels off, it was apparent that this unit was battery-powered. A nice sealed lead-acid pack in the back of the unit was perhaps half of it's weight. But, of course, the battery was stone-cold dead. I wrote the numbers down in case I wanted to order a replacement. An hour of gentle work with a soft cloth and a bit of Windex took care of the dirt. And the replacement knob fit perfectly, if looking a bit different from the others. No matter. The rubber stick-on feet had long since departed the unit, but I had a few in the junk box in Gwinnett county. A few adjustments, and this little puppy was working perfectly, as you can see from the picture. 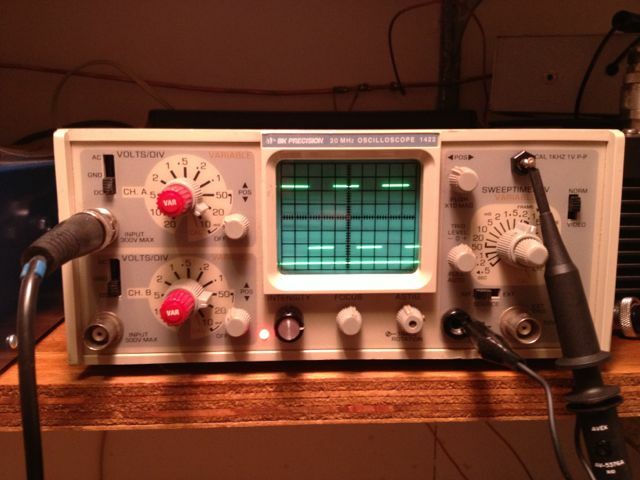 A sweet little addition to the micro-shack -- a perfectly sized micro oscilloscope!